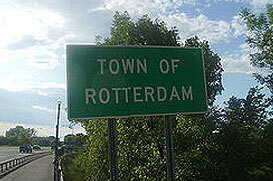 Rotterdam is a town in Schenectady County, New York. The Mohawk River defines the northeast town line. The New York State Thruway passes through the town. As of the census of 2000, there were 28,316 people, 11,544 households, and 8,092 families residing in the town. There are several different communities located within Rotterdam, including Colonial Manor, Cold Brook, Rotterdam Junction and South Schenectady. Rotterdam is situated just 10 miles west of Albany. It is one of the top suburban office and industrial centers in Upstate New York. Currently in a growth mode, the city is bringing in businesses that tap it’s highly educated workforce. Rotterdam is home to several of the best restaurants and shopping venues in Schenectady County.